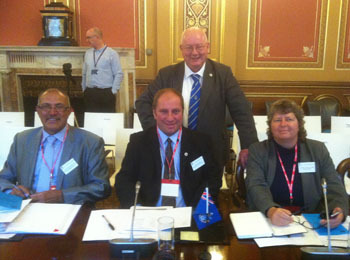 Tristan da Cunha's Chief Islander, Ian Lavarello, was in the UK in 2014 for a series of meetings 'crucial' to the future of the community. 'crucial' to the future of the community. at the Joint Ministerial Council Meeting on 2nd December 2014.
who will act as Tristan's UK Adviser. Tristan Chief Islander, Ian Lavarello, has left no one in any doubt – Tristan must have a new or strengthened harbour, if the community is to survive – and thrive. That was his constant theme throughout the 2014 Joint Ministerial Conference between UK Government Ministers and their Overseas Territories counterparts in London in December. The conference provides a unique opportunity for Territory leaders, the UK Representatives, UK Government Ministers and civil servants working with the Territories, to participate in frank and direct discussions on their priorities. Those leaders attending a pre-JMC meeting in the Cayman Islands in mid-2014 had already decided that the UK Government must agree to a new harbour for Tristan and warned of the consequences to all the UK's interests of collapse and evacuation. That theme was followed at the first meeting at the start of the week, of the Political Council of the UK Overseas Territories Association (of which Tristan is a member), with all Territories offering Tristan their unqualified support. In the opening session of the JMC, Ian presented Tristan as the “good news story” of the Overseas Territories: with Tristan lobster now allowed into the UK and EU countries and island initiatives in taking the manufacture and marketing of island handicrafts upmarket, the success of the community and its philosophy of self-sufficiency and mutual support, was evident. But of course, it all depended on the harbour – and leaving it in its present condition was not an option. That the messages about Tristan had been received loud and clear were evident from Ian's conversations with the Foreign Secretary, Rt. Hon. Philip Hammond MP and the Minister responsible the Overseas Territories, James Duddridge MP. At the beginning of the week, Ian had been involved in a one-to-one meeting with Mr Duddridge, discussing in addition to the harbour, Tristan’s concerns about the mice on Gough Island taking the Tristan albatross to the brink of extinction. They discussed social and economic issues, the possible effects of an ageing population on the economic future of the island and plans for a new hospital and other improvements. showing the JMC in session and Tristan Chief Islander Ian Lavarello. Thanks to Peter Millington for providing the images and credits. After the conclusion of the conference, Ian met the Minister at the Department for International Development with responsibility for the Overseas Territories, Rt. Hon. Desmond Swayne TD MP. They discussed, in detail, issues around the harbour, particularly the need to stabilise the existing structure and its surroundings, as a prelude to future work. Prior to going into the Minister’s office, Ian had met with the two officials from DfID working on the harbour project and the new hospital (for which detailed planning and procurement is now under way) for an update. The meeting also looked at the need to improve Tristan’s school, its telecommunications, its roadways and to develop renewable energy. Again, Ian found the Minister well briefed, positive and keen to learn more about the island and its ambitions for the future. In the course of the JMC week, Ian had also participated in a breakfast meeting with Parliament’s Environmental Audit Committee (chaired by Joan Walley MP) which has in the past, been critical of British government policy towards the conservation of its Territories' unique biodiversity. He was able to explain progress towards an elimination project to rid Gough of the mice to save the Tristan Albatross and also, commend the achievements of the Tristan Conservation Department. In front of the Foreign Affairs Committee, chaired by the influential MP, Sir Richard Ottaway, Ian was able to expand on concerns about the harbour, illegal fishing around Gough and the need for more Royal Navy patrols – as well as more infrastructure developments, in what he was careful to present as an economically and socially successful society. The Chief Islander dined in Carlton House, the Foreign Secretary's official residence, with the Overseas Territories and DfID Ministers (and the other Territory leaders) where they discussed in detail Tristan's situation: that evening, the UK Representative, Chris Bates and his wife, Julie, were guests at H.M. The Queen's Christmas Diplomatic Reception in Buckingham Palace, where they met Her Majesty and H.R.H. The Duchess of Cornwall. The conclusion of the conference is marked by a reception for some 400 Parliamentarians, Chief Ministers and their guests from the Territories, civil servants, business people, journalists and opinion formers. To celebrate the reception being the first occasion in the UK in which Tristan lobster could be served, the Minister (Mr Duddridge) announced guests would be the first people in the UK to sample it. Special menu cards had been prepared, Tristan’s fishing concessionaires Ovenstone Agencies (Pty) Ltd donated sufficient for everyone and Tristan flags and signs announcing the lobster appeared on each elegant glass tray carried by waiting staff. A display of a knitted Tristan penguin, flag, postcards and Tristan Newsletters adorned the mantelpiece. A senior civil servant confided afterwards:”Actually, the Tristan lobster was the talking point of the whole evening. It was enjoyed by everyone”. Ian was (uniquely) allowed by the Minister, after his speech, to propose a toast to thank the retiring Tristan UK Representative, Chris Bates. Afterwards, the Chief Islander said: “We started the process more than six months ago, concerned that none of the people with power and influence over Tristan's future, really understood the island’s needs, or the effect of its remote location and the necessity of a new harbour, hospital and for improvements to so many of the things that the community rely upon. Civil servants and politicians and others who we had worked with us for some time, and who understood this, had moved on. “'We hoped their replacements wouldn't assume they were dealing with the likes of the Scillies or Lundy Island rather than the world's most remote inhabited island. But now – thanks to the support of all the other Territories and their political leaders, as well as the civil servants who deal with Tristan – we know that everyone who needs to know, does understand our unique circumstances. I was impressed by their enthusiasm for Tristan and their determination to find ways to ensure we can continue to live and thrive on our island, as we approach our two-hundredth anniversary”. Preparing the to serve the lobster which was handed round to guests on a small biscuit on which was a cherry tomato stuffed with the lobster. Delicious! to have some delicious Tristan Lobster in England at last! 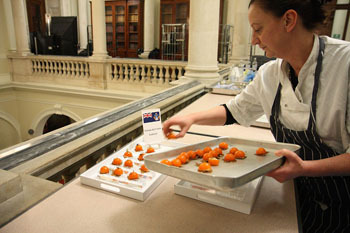 On the tray is the Tristan flag and notice to identify the dish. 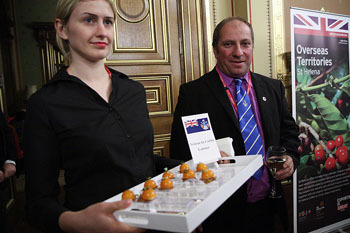 A moment of very considerable achievement for Tristan occurred at the Foreign and Commonwealth Office on Wednesday 3rd December 2014 when Tristan lobster was served for the very first time in the UK and the EU. 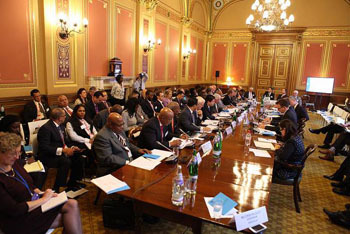 The occasion was the reception hosted by the Minister for the Overseas Territories, James Duddridge MP, to mark the conclusion of the Annual Joint Ministerial Council (of UK and Overseas Territories political leaders). Negotiations with the EU and others to get Tristan Lobster into the UK and the EU have taken over ten years and the first shipment had arrived only a few days beforehand. The FCO and their caterers agreed to serve it to guests (along with delicacies from other Overseas Territories) in the magnificent Victorian surroundings of the Locarno Suite. Guests included Ministers from the UK, Chief Ministers and leaders of all the Overseas Territories, civil servants, business partners, journalists and other stakeholders with whom we all work. I'm greatly indebted to Andrew James from the fisheries' concessionaires, Ovenstones Agencies for donating the lobster, and to his agents in the UK, to Lizzi White from the Foreign Office (who did the decorations), to the caterers and especially to the Minister for making this moment in Tristan's history possible. 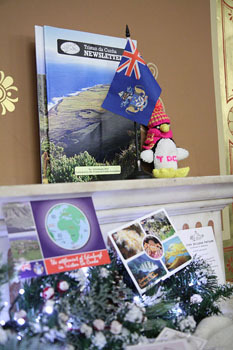 A display showing the delightful decoration on the mantle piece made up of a knitted Tristan penguin, a Tristan desk flag, Tristan postcard and copies of the Tristan Association's Newsletter. Tristan Chief Islander, Ian Lavarello, has given a detailed briefing on issues and concerns affecting the island to Andrew Rosindell MP, Chairman of the All Party Parliamentary Group on Overseas Territories, at a lengthy meeting in Westminster on 5th November. Andrew Rosindell has a long-standing interest in Tristan and has been particularly supportive of concerns over the harbour and the implications of the island should it collapse. 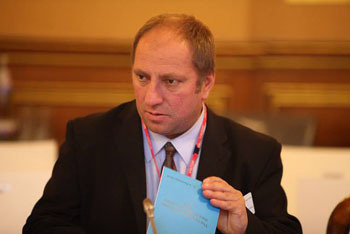 He spent 90 minutes in his office, which overlooks Big Ben and the Palace of Westminster, with Ian Lavarello, who briefed him on the state of the harbour, the islanders' belief that a new facility nearer The Ponds would be a more stable structure with a more viable future, and what many islanders see as the impractical approach of the UK Government. 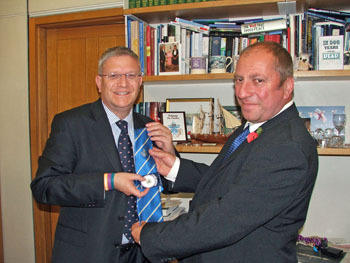 Chief Islander Ian Lavarello presents Andrew Rosindell MP in his Parliamentary office with a Tristan silk tie and badge. Ian discussed the background to the recent breakthrough with Tristan lobster now having access to markets in the EU countries (and ambitions for other future exports) and the time it had taken for the negotiations to succeed. He was able to explain the limitations placed on Tristan’s economy by the limited transport and telecommunications resources and to discuss the benefits which a dedicated shipping service between St Helena and Tristan could bring, once St Helena's airport opens – and the lack of any dividend should such a service not commence. Ian was also able to update Andrew Rosindell on the plans to eradicate from Gough Island the mice, which are eating alive the chicks of the Tristan Albatross and endangering other endemic species and to explain why the UNESCO World Heritage Site designation is crucial to Tristan's survival. They also discussed the need for upgrading Tristan’s school, the proposals to improve health care and to replace the Camogli Hospital, to invest in Tristan’s roads, telecommunications and island initiatives in marketing and exporting Tristan handicrafts. Tristan da Cunha's Chief Islander, Ian Lavarello, is in the UK for a series of meetings "crucial" to the future of the community. He will be attending the Joint Ministerial Council and the Political Council of the UK Overseas Territories Association in early December. Meetings have been scheduled between Ian and the UK Ministers responsible for the Overseas Territories and aid from DfID (Department for International Department), senior civil servants and stakeholders. Ian said: "My most pressing concern is to get across to the Ministers and Government Departments the need for a new harbour on Tristan to replace the crumbling Calshot Harbour breakwaters. At the moment, the UK Government is saying that if they become damaged, then they will repair them - but I have to emphasise the Administrator's point (Tristan da Cunha Newsletter February 2014) that if the island has to be evacuated (because of a collapse of the breakwaters), there will be no way back for the population. "I need to get over the point that if the present structure collapses, then there will be no way to land repair equipment, materials or experts -- or food, people, medical supplies, fuel, mail and freight -- because of Tristan's remote location. The islanders are adamant that they need a new harbour". The need for urgency in replacing Tristan's hospital, to approve a plan to remove the mice killing the albatross and petrel chicks on Gough, to modernise the school buildings and improve the island's infrastructure, are also high on Ian's list. He has already spoken in the Houses of Parliament to a meeting the All Party Parliamentary Group on the Environment looking at the Overseas Territories and described to them his experiences on Gough, looking at the effect of the mice on the wildlife of this UNESCO World Heritage Site. 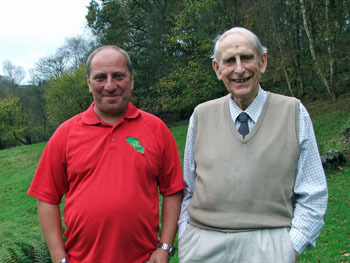 Ian has meetings with other APPGs (All Party Parliamentary Groups), MPs and stakeholders in his diary and during a visit to Tristan Association president, Michael Swales, at his home in Staffordshire, brought him up to date with news from the island and on his hopes for the outcome of the meetings and conferences.